Welcome to #FunFlowerFriday, a bi-weekly blog post about different flowers where we discuss their origin, common names, different varieties, uses and any other tidbits. This week is the delicate and beautiful Scabiosa, also called the Pincushion Flower due to the prominent stamens in the center and round blossoms looking like pins in a pincushion. The first time I heard of this flower I instantly thought of Hermione Granger in Harry Potter saying, “Levi-O-sa, not Levio-SA” thinking “Scabi-O-sa, not Scabio-SA.” (BTW I’m a HUGE HP fan. ) Pronunciation aside, this delicate flower is often seen dancing above other flowers in bridal bouquets, centerpieces and even daily arrangements. The name comes from the latin word “scabies” meaning “the itch” which it was used as a remedy against scabies back in the day. 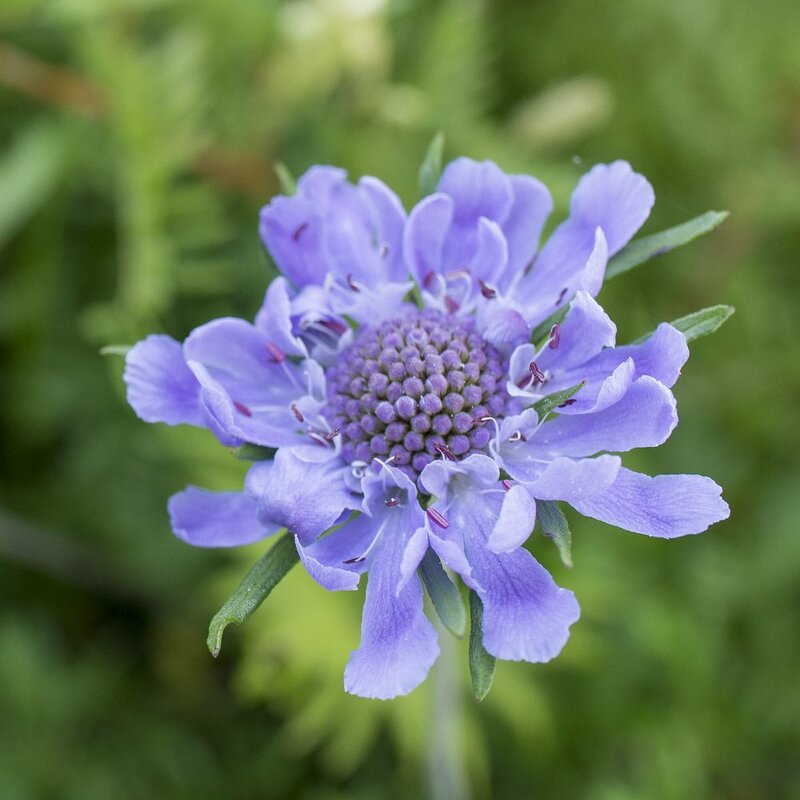 The variety Scabiosa succisa is used in traditional herbal medicine to treat coughs, fevers and internal inflammation. Not only do flowers give us natural beauty in our daily lives but they can also aid in our healing! This flower is native to Europe and Asia but grows beautifully right here in Montana. Generally they have a smaller bloom but some can grow to be about 3 inches in size. There are many species and varieties however most come in a soft blue, lavender or creamy white flower which makes them excellent for use in weddings. Do you like butterflies? Plant these babies in your yard or garden and watch the butterflies come and drink the rich nectar from your flowers. They’re pretty low maintenance and will bloom all season long. As a cut flower, they can last between 5-10 days under the right circumstances. 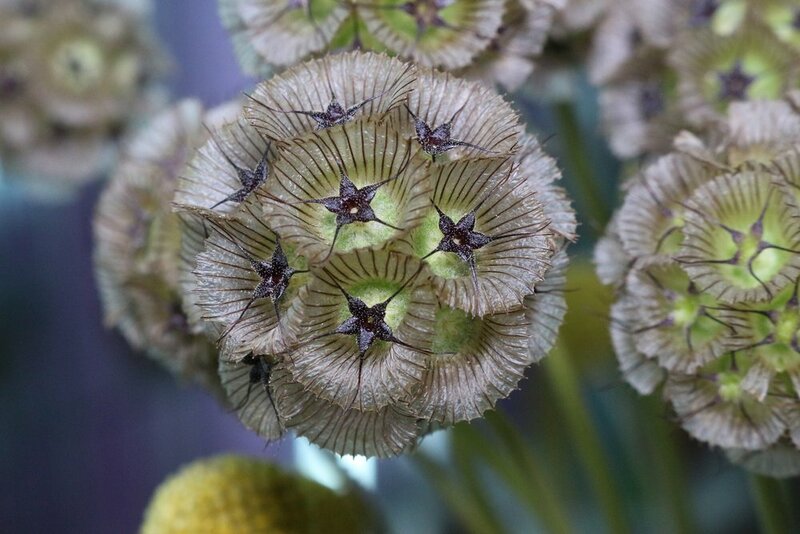 After they have bloomed, the dried seed heads are great for adding texture and interest to arrangements. Why not request some of these beauties in your next arrangement to add some fun texture and movement to the arrangement. Our local flower farms here in Montana have been growing some amazing scabiosas and I love adding them to my arrangements, hoping to introduce new flowers to the recipient and opening their eyes to all the possibilities!